HFS Chicago Scholars helps economically disadvantaged Chicago high school students flourish in and out of the classroom by providing educational enrichment through our lifelong mentoring, college readiness and academic excellence programs, as well as providing financial assistance to attend top Chicago-area schools. On average, over 90% of our scholars make the honor roll of the top schools in the city. 100% of our graduates are accepted to and attend top colleges and universities, such as Harvard, Princeton, University of Illinois – Champaign, Loyola University, University of Michigan, Indiana University, Drake University, Loras College, and the University of Notre Dame. Our high school graduates include three valedictorians and one salutatorian of four of the city’s top schools. In 1991, Michael Kennelly, founder of HFS Chicago Scholars, was inspired by a speech by the late Cardinal Bernardin, Archbishop of Chicago, during which the Cardinal lauded the community work of Holy Family Parish on Chicago’s near south side and several other inner-city schools. Mike informed the Cardinal on the spot that he would be very interested in getting involved with the Holy Family students in any way possible. Two months later, an eighth-grade teacher at Holy Family Elementary School called Mike and asked him to speak to her class about his work as a business consultant at Arthur Andersen. He did and fell in love with the students. Determined to help fulfill the educational aspirations of these motivated yet needy scholars, Mike immediately went to work: he recruited over 200 Arthur Andersen employees to operate a tutoring program for Holy Family eighth-graders; he solicited 25 Arthur Andersen partners to start a high-school scholarship fund for the top graduates of the school; he contributed financial support to build a computer lab at the school and hired a teacher to run it; and, most importantly, Mike became very involved in the lives of some very special children and families. Thus the Arthur Andersen Tutoring and Mentoring Program was founded in December 1992.In December 1993, as a result of the interest of two Arthur Andersen partners, Gary Holden and Dean Fischer, the program was renamed the HFS Scholarship Fund. Through their generous contribution and support, along with that of many other Andersen employees, HFS Scholarship Fund became a community service program with the goal of serving Holy Family School as well as providing motivated children from Chicago’s poorest neighborhoods with the means to reach a brighter future. The program worked, not just by placing the neediest students in an improved learning environment, but by challenging them with standards beyond their classmates and supporting them to help them achieve their goals.The Holy Family School has since closed. Our name has once again changed to HFS Chicago Scholars as we have united with our new partners, the Full Plate Foundation—a scholarship program offering HFS graduates financial assistance as they make the transition to college—in order to reinforce the message that we are not just an organization that provides needy students with scholarships. We are an organization that provides never-ending support to our scholars in all areas of life deemed important to achieving one’s goals. 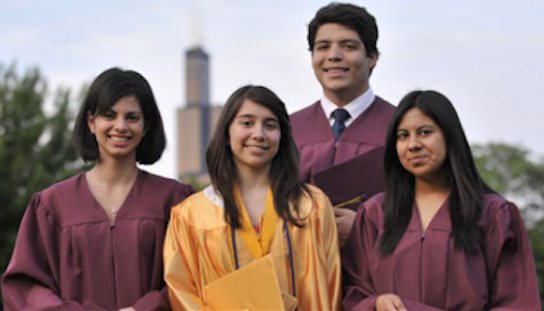 HFS Chicago Scholars continues to flourish and has become an amazing success story.